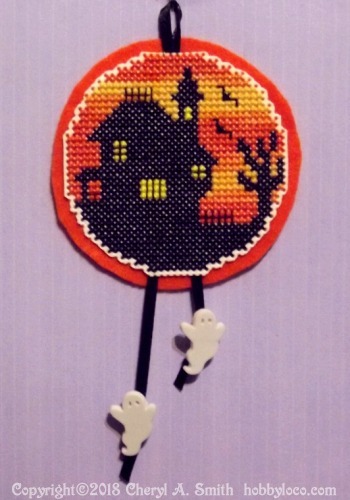 I love to stitch ornaments for Halloween as well as Christmas! So I thought I would show how a simple free pattern can be made into a cute Halloween ornament. There are no half stitches. Since only two colors are used, this chart stitches up fairly quickly! The ornament shown was made by taking my old house chart and stitching it on 14 count plastic canvas. I backed the stitched piece with felt and trimmed around the edge. Then I added a ribbon and some little ghost beads to finish off the ornament. Project may be completed in a weekend! Click Here for printable pattern in separate window.